Palonosetron hydrochloride is a white to off-white crystalline powder. It is freely soluble in water, soluble in propylene glycol, and slightly soluble in ethanol and 2-propanol. ALOXI injection is a sterile, clear, colorless, non-pyrogenic, isotonic, buffered solution for intravenous administration. Each 5-ml vial of ALOXI injection contains 0.25 mg palonosetron base as hydrochloride, 207.5 mg mannitol, disodium edetate and citrate buffer in water for intravenous administration. The pH of the solution is 4.5 to 5.5. 1 ALOXI® is a registered trademark of Helsinn Healthcare SA, Lugano, Switzerland. 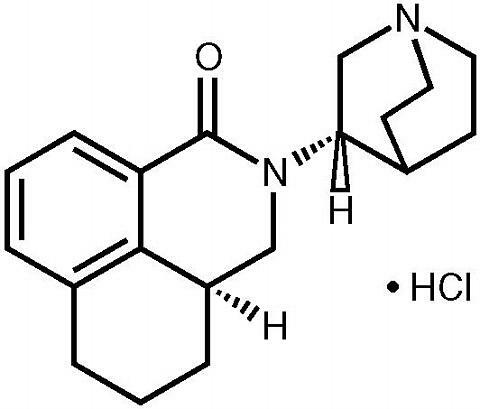 © 2004 Mgi Pharma, INC., Bloomington, MN 55437 U.S.A.
Palonosetron is a selective 5-HT 3 receptor antagonist with a strong binding affinity for this receptor and little or no affinity for other receptors. The effect of palonosetron on blood pressure, heart rate, and ECG parameters including QTc were comparable to ondansetron and dolasetron in clinical trials. In non-clinical studies palonosetron possesses the ability to block ion channels involved in ventricular de- and re-polarization and to prolong action potential duration. In clinical trials, the dose-response relationship to the QTc interval has not been fully evaluated. After intravenous dosing of palonosetron in healthy subjects and cancer patients, an initial decline in plasma concentrations is followed by a slow elimination from the body. Mean maximum plasma concentration (C max ) and area under the concentration-time curve (AUC 0-(infinity) ) are generally dose-proportional over the dose range of 0.3-90 µg/kg in healthy subjects and in cancer patients. Following single IV dose of palonosetron at 3 µg/kg (or 0.21 mg/70 kg) to six cancer patients, mean (±SD) maximum plasma concentration was estimated to be 5.6 ± 5.5 ng/mL and mean AUC was 35.8 ± 20.9 ng hr/mL. Palonosetron is eliminated by multiple routes with approximately 50% metabolized to form two primary metabolites: N-oxide-palonosetron and 6-S-hydroxy-palonosetron. These metabolites each have less than 1% of the 5-HT 3 receptor antagonist activity of palonosetron. In vitro metabolism studies have suggested that CYP2D6 and to a lesser extent, CYP3A and CYP1A2 are involved in the metabolism of palonosetron. However, clinical pharmacokinetic parameters are not significantly different between poor and extensive metabolizers of CYP2D6 substrates. After a single intravenous dose of 10 µg/kg [ 14 C]-palonosetron, approximately 80% of the dose was recovered within 144 hours in the urine with palonosetron representing approximately 40% of the administered dose. In healthy subjects the total body clearance of palonosetron was 160 ± 35 mL/h/kg and renal clearance was 66.5±18.2 mL/h/kg. Mean terminal elimination half-life is approximately 40 hours. Population PK analysis and clinical safety and efficacy data did not reveal any differences between cancer patients >/= 65 years of age and younger patients (18 to 64 years). No dose adjustment is required for these patients. Intravenous palonosetron pharmacokinetics was characterized in twenty-four healthy Japanese subjects over the dose range of 3-90 µg/kg. Total body clearance was 25% higher in Japanese subjects compared to Whites, however, no dose adjustment is required. The pharmacokinetics of palonosetron in Blacks has not been adequately characterized. Palonosetron is eliminated from the body through both renal excretion and metabolic pathways with the latter mediated via multiple CYP enzymes. Further in vitro studies indicated that palonosetron is not an inhibitor of CYP1A2, CYP2A6, CYP2B6, CYP2C9, CYP2D6, CYP2E1 and CYP3A4/5 (CYP2C19 was not investigated) nor does it induce the activity of CYP1A2, CYP2D6, or CYP3A4/5. Therefore the potential for clinically significant drug interactions with palonosetron appears to be low. A study in healthy volunteers involving single-dose IV palonosetron (0.75 mg) and steady state oral metoclopramide (10 mg four times daily) demonstrated no significant pharmacokinetic interaction. Efficacy of single-dose palonosetron injection in preventing acute and delayed nausea and vomiting induced by both moderately and highly emetogenic chemotherapy was studied in three Phase 3 trials and one Phase 2 trial. In these double-blind studies, complete response rates (no emetic episodes and no rescue medication) and other efficacy parameters were assessed through at least 120 hours after administration of chemotherapy. The safety and efficacy of palonosetron in repeated courses of chemotherapy was also studied. Two Phase 3, double-blind trials involving 1132 patients compared single-dose IV ALOXI with either single-dose IV ondansetron (study 1) or dolasetron (study 2) given 30 minutes prior to moderately emetogenic chemotherapy including carboplatin, cisplatin </= 50 mg/m 2 , cyclophosphamide < 1500 mg/m 2 , doxorubicin > 25 mg/m 2 , epirubicin, irinotecan, and methotrexate > 250 mg/m 2 . Concomitant corticosteroids were not administered prophylactically in study 1 and were only used by 4-6% of patients in study 2. The majority of patients in these studies were women (77%), White (65%) and na[iuml ]ve to previous chemotherapy (54%). The mean age was 55 years. A Phase 2, double-blind, dose-ranging study evaluated the efficacy of single-dose IV palonosetron from 0.3 to 90 µg/kg (equivalent to < 0.1 mg to 6 mg fixed dose) in 161 chemotherapy-na[iuml ]ve adult cancer patients receiving highly-emetogenic chemotherapy (either cisplatin >/= 70 mg/m 2 or cyclophosphamide > 1100 mg/m 2 ). Concomitant corticosteroids were not administered prophylactically. 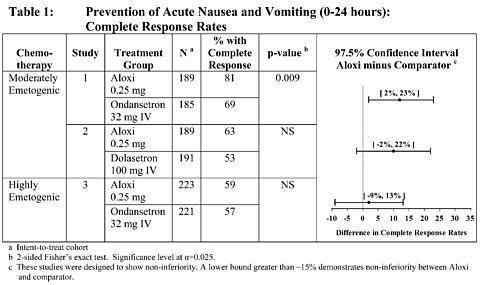 Analysis of data from this trial indicates that 0.25 mg is the lowest effective dose in preventing acute nausea and vomiting induced by highly emetogenic chemotherapy. A Phase 3, double-blind trial involving 667 patients compared single-dose IV ALOXI with single-dose IV ondansetron (study 3) given 30 minutes prior to highly emetogenic chemotherapy including cisplatin >/= 60 mg/m 2 , cyclophosphamide > 1500 mg/m 2 , and dacarbazine. Corticosteroids were co-administered prophylactically before chemotherapy in 67% of patients. Of the 667 patients, 51% were women, 60% White, and 59% na[iuml ]ve to previous chemotherapy. The mean age was 52 years. The antiemetic activity of ALOXI was evaluated during the acute phase (0-24 hours) [Table 1], delayed phase (24-120 hours) [Table 2], and overall phase (0-120 hours) [Table 3] post-chemotherapy in Phase 3 trials. the prevention of delayed nausea and vomiting associated with initial and repeat courses of moderately emetogenic cancer chemotherapy. Hypersensitivity reactions may occur in patients who have exhibited hypersensitivity to other selective 5-HT 3 receptor antagonists. Although palonosetron has been safely administered to 192 patients with pre-existing cardiac impairment in the Phase 3 studies, ALOXI should be administered with caution in patients who have or may develop prolongation of cardiac conduction intervals, particularly QTc. These include patients with hypokalemia or hypomagnesemia, patients taking diuretics with potential for inducing electrolyte abnormalities, patients with congenital QT syndrome, patients taking anti-arrhythmic drugs or other drugs which lead to QT prolongation, and cumulative high dose anthracycline therapy. In 3 pivotal trials, ECGs were obtained at baseline and 24 hours after subjects received palonosetron or a comparator drug. In a subset of patients ECGs were also obtained 15 minutes following dosing. The percentage of patients (< 1%) with changes in QT and QTc intervals (either absolute values of > 500 msec or changes of > 60 msec from baseline) was similar to that seen with the comparator drugs. Palonosetron is eliminated from the body through both renal excretion and metabolic pathways. Therefore, the potential for clinically significant drug interactions with palonosetron appears to be low (See CLINICAL PHAR-MACOLOGY , Drug-Drug Interactions section). In a 104-week carcinogenicity study in CD-1 mice, animals were treated with oral doses of palonosetron at 10, 30 and 60 mg/kg/day. Treatment with palonosetron was not tumorigenic. The highest tested dose produced a systemic exposure to palonosetron (Plasma AUC) of about 150 to 289 times the human exposure (AUC= 29.8 ng·h/ml) at the recommended intravenous dose of 0.25 mg. In a 104-week carcinogenicity study in Sprague-Dawley rats, male and female rats were treated with oral doses of 15, 30 and 60 mg/kg/day and 15, 45 and 90 mg/kg/day, respectively. The highest doses produced a systemic exposure to palonosetron (Plasma AUC) of 137 and 308 times the human exposure at the recommended dose. Treatment with palonosetron produced increased incidences of adrenal benign pheochromocytoma and combined benign and malignant pheochromocytoma, increased incidences of pancreatic Islet cell adenoma and combined adenoma and carcinoma and pituitary adenoma in male rats. In female rats, it produced hepatocellular adenoma and carcinoma and increased the incidences of thyroid C-cell adenoma and combined adenoma and carcinoma. Of the 1374 adult cancer patients in clinical studies of palonosetron, 316 (23%) were >/= 65 years old, while 71 (5%) were >/= 75 years old. No overall differences in safety or effectiveness were observed between these subjects and the younger subjects but greater sensitivity in some older individuals cannot be ruled out. No dose adjustments or special monitoring are required for geriatric patients. In clinical trials for the prevention of nausea and vomiting induced by moderately or highly emetogenic chemotherapy, 1374 adult patients received palonosetron. 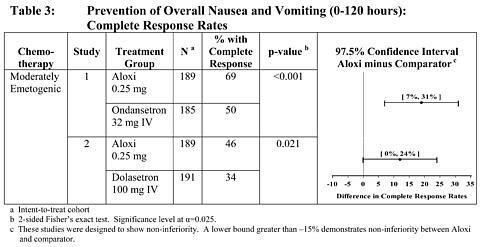 Adverse reactions were similar in frequency and severity with ALOXI and ondansetron or dolasetron. Following is a listing of all adverse reactions reported by >/= 2% of patients in these trials (Table 4). In other studies, 2 subjects experienced severe constipation following a single palonosetron dose of approximately 0.75 mg, three times the recommended dose. One patient received a 10 µg/kg oral dose in a post-operative nausea and vomiting study and one healthy subject received a 0.75 mg IV dose in a pharmacokinetic study. Hearing and Vision: < 1% motion sickness, tinnitus, eye irritation and amblyopia. There is no known antidote to ALOXI. Overdose should be managed with supportive care. Fifty adult cancer patients were administered palonosetron at a dose of 90 µg/kg (equivalent to 6 mg fixed dose) as part of a dose ranging study. This is approximately 25 times the recommended dose of 0.25 mg. This dose group had a similar incidence of adverse events compared to the other dose groups and no dose response effects were observed. Dialysis studies have not been performed, however, due to the large volume of distribution, dialysis is unlikely to be an effective treatment for palonosetron overdose. A single intravenous dose of palonosetron at 30 mg/kg (947 and 474 times the human dose for rats and mice, respectively, based on body surface area) was lethal to rats and mice. The major signs of toxicity were convulsions, gasping, pallor, cyanosis and collapse. The recommended dosage of ALOXI is 0.25 mg administered as a single dose approximately 30 minutes before the start of chemotherapy. 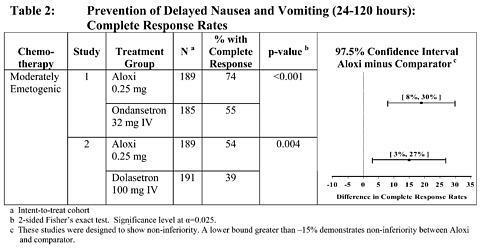 Repeated dosing of ALOXI within a seven day interval is not recommended because the safety and efficacy of frequent (consecutive or alternate day) dosing in patients has not been evaluated. A recommended intravenous dosage has not been established for pediatric patients. ALOXI is to be infused intravenously over 30 seconds. ALOXI should not be mixed with other drugs. Flush the infusion line with normal saline before and after administration of ALOXI. ALOXI (palonosetron hydrochloride), 0.25 mg (free base) in 5 ml, is supplied as a single-use sterile, clear, colorless solution in glass vials ready for intravenous injection. Store at controlled temperature of 20-25°C (68°F-77°F). Excursions permitted to 15-30°C (59-86°F). Protect from freezing. Protect from light. Distributed by Mgi Pharma, INC., Bloomington, MN, U.S.A.